The last post in this series was about diving in to “Dynamic Blocks” ‘Point’ and ‘Alignment’ Parameters and the ‘Move’ and ‘Stretch’ Actions. <link>. This post will be just changing the Phone_Board block created in the previous post to remove the ‘Alignment’ Parameter and add some additional insertion points. ‘Figure B’ below is a view in the block editor showing the additional ‘Points’ added and ‘Alignment’ removed. The ‘Move’ and ‘Stretch’ points will actually also be optional insertion points – whether you want it or not. (There is probably a way around this, I just have not spent the time to figure it out – If you know, please enlighten me! The exclamation points, which typically indicate an issue, are ok if they are just being used as multi-insertion point parameters. Test the block to make sure it is doing what is expected – pick on the right end of the block and drag the point left or right. If all is well, close test window and save your block. So what do these extra points do for us? If you created this block or something like it and you added multiple points, when the block is inserted, as you tap the ‘CTRL’ key, the insertion point will alternate to each point – handy! In the next post, I will cover the flip and rotate Parameters and Actions. Are you new to AutoCAD? Have you been using AutoCAD for years but only use the blocks, styles, layers and tools that others have created? Do you want to learn more or step up your game on features you’re not very strong in and pick up some practical examples of best practices? If so, this series is for you. Over the course of 12 months and maybe more I will cover the basics of a lot of AutoCAD tools and features that many may want or need to learn more about. This is the 8th article in my AutoCAD 101 series – to read about the origination for this series, see the first post here: <Intro> The last post in this series was about diving in to “Dynamic Blocks” <link>, this post will be diving in to the ‘Point’ and ‘Alignment’ Parameters and the ‘Move’ and ‘Stretch’ Actions. Up until now, I have been using a 2×4 Light fixture for the how-tos, for this post, I am going to switch to a new block. For the various parameters and actions being discussed, I am going to introduce the ‘Phone_Board’. Typical phone board blocks are a 4′ wide by 1″ or so thick rectangle that sometimes includes a hatch. When other sizes are needed, it is often exploded and stretched. In this post I will cover adding the ability to re-size the block, align it with a wall surface and toggle through various insertion points, as well as combine it with the previous discussed Visibility state option to make this a super phone board! Below is the final product highlighted to show the various points on the Block with which Parameter/Action each one is associated with. Before we get in to adding the parameters, lets make a quick phone board block. The most common phone board sizes are 4’x4′ and 4’x8′ vertical or horizontal. So I will start by making a rectangle on layer ‘0’ (zero) that is 48″ wide by 1″ thick with the insertion point on the lower left side of the rectangle, which will be the ‘back’ side, then save this block as ‘Phone_Board’. As stated previously, a common issue with phone board blocks is their size – 4ft does not work in all conditions. What I have seen some companies do in the past is to create multiple blocks for the various sizes – which works pretty well until you get the requirement to wrap a room with phone boards that is not in 4ft increments – so off to explode they go. We don’t believe in exploding blocks here – Right? Right!!??!? So the Phone_Block I am creating will be resizeable. For this we need the point parameter. The point is the first parameter on the Parameters menu and can be use with various ‘Actions’. For this post I am going to use it for two actions – ‘Stretch’ and ‘Move’. I will address the resize dilemma by adding a ‘Point’ parameter to the end of the block and assign the ‘Stretch’ action to it. Pick the ‘Point’ parameter and place on the far right side of the rectangle in the mid-point of the vertical line. Note: If you are following along, on the remaining steps, watch the command prompt to see what is being asked for. 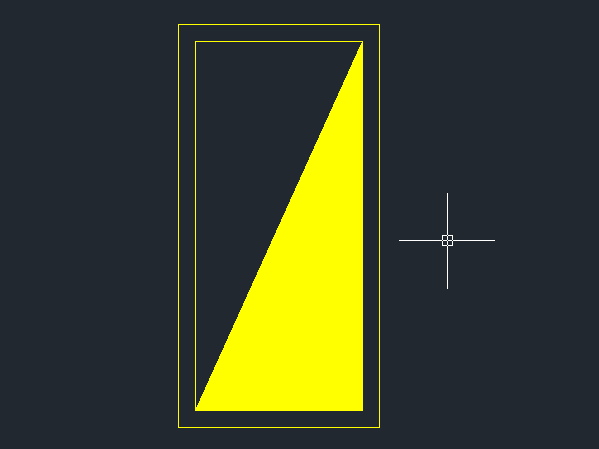 Create a stretch frame around the end of the right side of the rectangle, crossing the ‘Point’ parameter. Select the objects that need to stretch – which in this case is the right end of the rectangle. Do this with the crossing selection, and get the parameter as part of the selection. Test the block to make sure it is doing what is expected – pick on the right end of the block and drag the point left or right. If all is well, close test window and go to next step. Once the block can be resized, the next challenge is getting it inserted on the right wall surface. By adding an ‘Alignment’ parameter to the block, it will automatically align to the wall surface chosen – no matter what weird angle it is at. 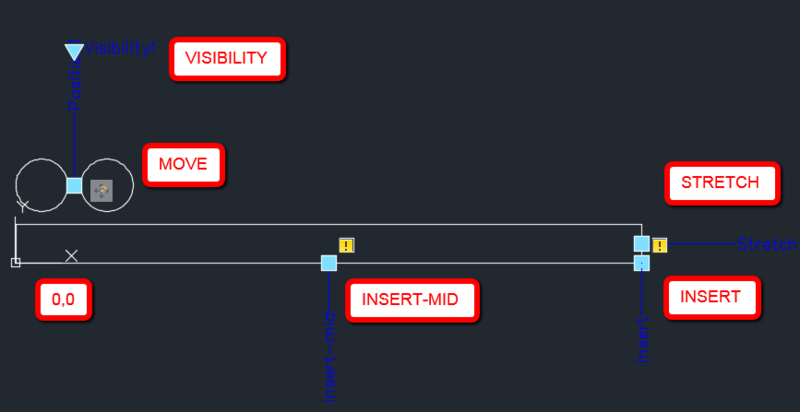 In AutoCAD there is an ‘Align’ command for align objects. Within dynamic blocks, you can use an ‘Alignment’ parameter. Like the ‘Visibility’ parameter, this has no associated Action menu item. With the alignment parameter on a block, when you move your block near a surface, it will automatically align with that surface. This can be a bit tricky to do and you have to understand how it works to get your ‘Alignment’ parameter placed properly. The important thing is to have the pointed end of the symbol facing in the direction of the object that you want the block to align with. Pick the ‘Alignment’ parameter and place at the insertion point of the rectangle (lower left). Pull the cursor to the left to have the alignment parameter point down (this is the direction of the wall that the board will be mounted to). Test the block to make sure it is doing what is expected – when sliding towards a wall, the block should automatically align with the wall. This can be a touchy process, which is why for small items I avoid using this parameter. If all is well, close the test window and go to the next step. Now the Phone board can be resized and will align to a wall – the next step is to add some additional functionality to it by combining two Parameters – ‘Point’ and ‘Visibility’. In many situations the phone board is in a building that is served by conduits from the outside or has conduits that lead to other spaces – like bldg tenants. I added (6) conduits to my block and made each combo of (0) to (6) it’s own visibility state. Now when inserting the phone board, I can choose a number from the the visibility states menu of 0-Conduits to 6-Conduits. See Figure below. The sequence in ‘Figure C’ shows the order to be 2-Conduits first, then 1, then 0; this is because the 2-Conduit version is what is used most often, so that will be the default inserted view. Copy the circle 5 more times to the right at 2-1/2″ apart. 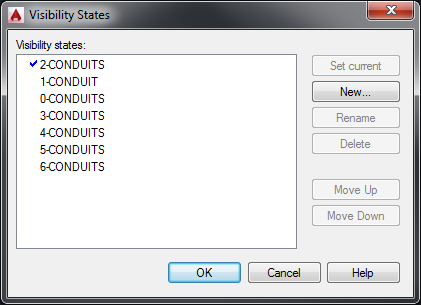 From the parameters menu, insert the Visibility parameter above the first conduit furthest to the left. In the Visibility state manger pull-down add the various states per the graphic in ‘Figure C’. If you need help with this step, see the post on Visibility states here. Test the block to make sure it is doing what is expected. If all is well, close the test window and go to the next step. Now that we have the ability to show conduits, there may be a situation that these conduits come up in the middle of the board or at the other end of where they are shown by default. For the other end, I could mirror the block, but that will not work in the middle – Do I Explode and Move? NO! I’ll just add a move parameter to the conduits. This process uses the ‘Point’ parameter again combined with the ‘Move’ Action. Pick the ‘Point’ parameter and place in the center of the left most two circles. (Since I typical use (2-Conduits) more than any other view this is why I chose this location. For this step, since you were in the (6-Conduits) view for object selection, you will not see your ‘Move’ grip… This is important to experience, because the ‘current’ visibility state may not reflect some of the actions you are assigning. If all is well, close the test window and go to the next step. Since I used the ‘Alignment’ parameter in this post, I will do a short post follow-up showing a multi-point insertion option and then follow that up with the ‘Flip’ and ‘Rotate’ Parameters and Actions. 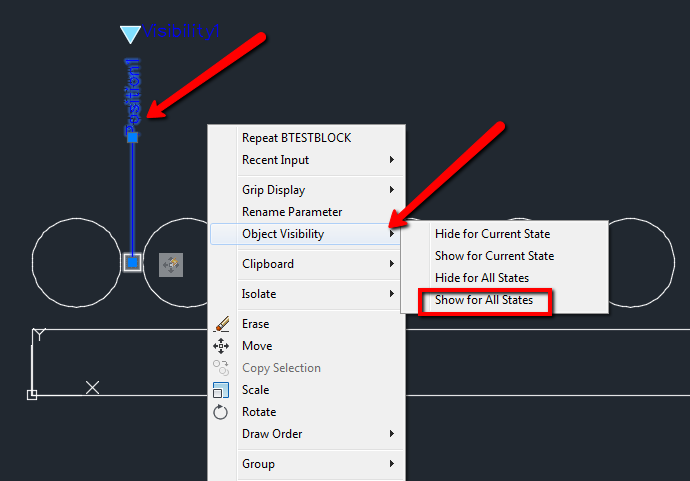 This is the 7th article in my AutoCAD 101 series – to read about the origination for this series, see the first post here: <Intro> The last post in this series was about diving in to “Dynamic Blocks” <link>, this post will be diving in to Visibility States. Let’s start with an example of something that affects both architects and electrical engineers – Lighting. Since we have been using the 2X4-Light fixture as an example in our previous posts, I’ll continue with it for this topic. Architects use Lighting to enhance the visual appeal of spaces while electrical engineers use them to provide required illuminance. In order to show the different types of lighting in a building, you could put letters and numbers next to a light symbol to indicate what it is, then, a schedule could be referenced to describe the fixture in more detail. But if you actually gave each block a unique look, you could tell just by looking at it what it is. This also helps the project owner or client visually see what the light is by just looking at the floor plan. One commonly used light fixture is the 2×4 recessed fixtures that are found on almost every commercial project. Although these fixtures are one size, they can be a variety of lighting types (Prismatic, Parabolic, LED, Direct/Indirect as well as Emergency versions of each). See ‘Figure A’ below that shows a small variety of light fixture types. All of these light fixtures are actually in one block and use the dynamic Visibility option to change the views that represent each individual look. 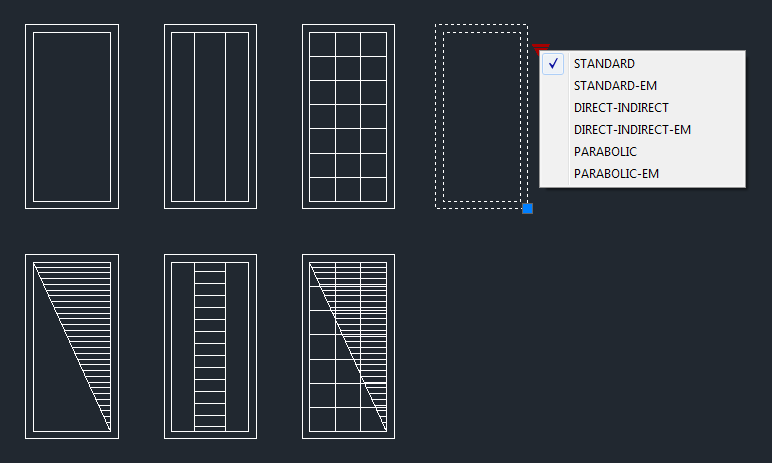 With this one block, you could place 2×4 fixtures throughout your project, then in rooms that needed specialty fixtures like parabolic or direct-indirect, you would highlight the fixtures in the room or rooms, right click and select quick properties and choose the parabolic version from the drop-down menu. You could repeat the same process for the lights required to be emergency or night lights as well. The variety of lighting types used on a project that are similar in nature but have some unique characteristics could easily be shown in a single block and quickly changed using the dynamic visibility state option. The steps outlined here will work for any trade or block – you just need to determine which feature will benefit you in your work and use that when defining or modifying your blocks. I use dynamic blocks for two primary reasons – minimize the number of blocks required to represent items in a drawing and make changes quicker. You may want to start using dynamic blocks by creating new blocks from scratch or since you probably already have an extensive block library a better approach may be to modify an existing block that you currently use by adding dynamic features to it. Like any customization process there are a series of steps that you would typically go through to implement your ideas. Start out by planning on what you want your block to do. Often this comes from experience with blocks that you keep replacing, rotating, flipping or changing out. Draw your block geometry or edit an existing block to add dynamic features. Choose a ‘Parameter’; there are various Parameters to choose, see ‘Figure B’ for a screen shot of the dynamic options pallet. Match an ‘Action’ with your parameter – see ‘Figure C’. Repeat 1 – 5 for each dynamic option. The items in red in ‘Figures B and C’ are what will be covered over the next few posts on dynamic blocks. For this post I will just cover the Visibility Parameter. For the dynamic block demonstration here I am going to start with our ‘2×4-Light’ fixture that I have been using in previous posts and add the visibility parameter to make it more flexible. You can follow along with any type of block that you already have and want the ability to change it’s look of on the fly (Visibility State). Like many blocks, our light fixture is composed of basic lines and hatches. From experience of working with lighting plans, I know that the basic 2×4 fixture often gets changed out for a more decorative one like direct-indirect or parabolic fixtures in some offices or conference rooms. Throughout the building emergency ballasts may be used to make the light an emergency light, which is typically indicated by a hatch or fill. To make my job easier, I do not want to erase the old block and insert a new one for each change I need to make. So for this issue I use ‘Visibility States’, using the Visibility Parameter. Visibility states allow you to change the look of a block by selecting a pull-down menu and choosing the new look or ‘state’. Note that ‘Visibility’ is the one parameter that does not require an Action item associated with it. 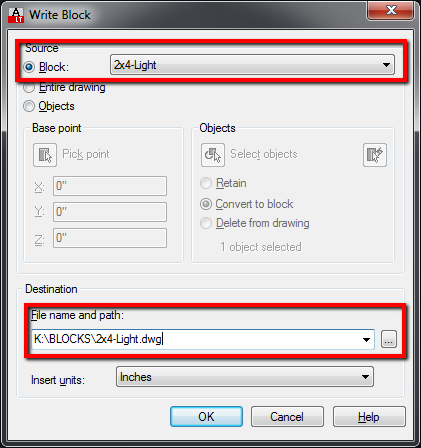 I open the existing block called ‘2×4-light’ in AutoCAD, and type Bedit to open the block editor. See ‘Figure D’ that shows the block editor toolbar. If you are not a ribbon rebel like me, see ‘Figure E’ for the ribbon version of the block editor. When entering the block editor you will get the dynamic options pallet shown above in ‘Figures B and C’, and the block editor toolbar or Pallet shown in ‘Figures D and E’. I select the Visibility parameter option and place it next to my block. When doing this think about how your final block look will change so that your parameter does not end up under some of your line work. I now see a new toolbar on the screen, the visibility toolbar, see Figure F. I select the button that opens up the Visibility states option and rename the default menu item to ‘Standard’. I then select ‘New’, and name the new state ‘Emergency’. 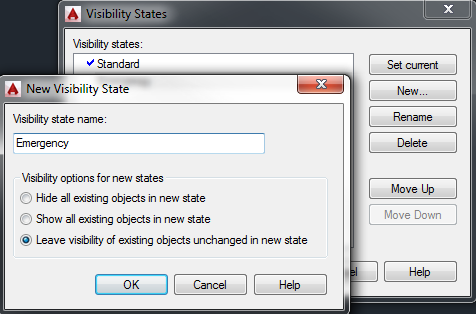 You may be asked if you want to “Leave the visibility of the existing objects unchanged in the new state”. Since I am only going to be adding line work for this particular view, I will choose the option to leave the objects in the new visibility state as it currently is shown; see ‘Figure G’. Note that you can determine the default view or ‘visibility state’ by moving the one you want as default to the top of the Visibility states list. Next, with the ‘Emergency’ state checked off in the list I’ll then draw an angled line between the top right and lower left of my internal rectangle to create hatch boundary and then choose my hatch command and hatch the space to the right side of the angled line. Once this is done, on the block editor toolbar/pallet there is a small symbol with a check mark next to it. This is the symbol to test the new dynamic options. Once the block is highlighted in the test mode a blue triangle will show up off to the side. By selecting the triangle I can choose between the ‘Standard’ and ‘Emergency’ display options. If all is well I can move on to the next fixture type; but if not I can make the necessary corrections and test again. Make this a habit, as finding and fixing issues later, after you have added a bunch of dynamic features can be a nightmare. Once testing is complete I can move on. Now I want to expand this block to also represent all the other fixture types shown in Figure A. Highlight the ‘Standard’ Visibility State each time you start a new fixture type, and when you are adding the emergency option, select the standard option of the that fixture type first. See below a bulleted list of steps to use for each fixture type. When adding new parameters and actions and you have multiple visibility states, make sure you are on the state that you wish to perform the new action. This is not a deal-breaker, as it can be corrected with a few extra steps – but keep it in mind. Choose the combo ‘Shaded/Open’ box symbol. (This will show all other entities in a grey faded color as they are not part of this Visibility state). Choose the larger solid shaded box and pick the hatch that was created for the previous ‘Standard’ fixture. (This hatch will now show up in both emergency versions (Standard and Parabolic) of the light fixture). You could have redrawn the hatch, but that adds additional size to the block, and you want to keep your blocks as lean as possible. The block now has (4) visibility states, representing Standard and Emergency versions of two fixture types. Try the final two states for direct/in-direct on your own. Combining Wipe-outs in to your blocks will add even more flexibility to your dynamic blocks. For instance in our light fixture block, adding a wipeout behind the fixture keeps anything else on the ceiling plan from bleeding through , I.e. putting fixtures in a gypsum board ceiling that is hatched with a pattern. Other examples would include room name blocks that have wipeouts to mask the background or door blocks that have wipeouts to hide the wall underneath making it appear that wherever you place your door the wall is on that wall is automatically cleaned up. In the next post, I will go over the Point, Alignment and Basepoint Parameters. This is the 6th article in my AutoCAD 101 series – to read about the origination for this series, see the first post here: <Intro> The last post in this series was about “important stuff” to consider when making blocks <link>, this post will be about diving in to Dynamic Blocks. We have wrapped up the basics of blocks in the past few posts, so let’s get in to some more advanced block work and look at Dynamic Blocks. In the course of a design day or projects timeline blocks are moved, copied, mirrored, rotated and sometimes completely replaced. An efficient way to reduce your work load and speed up some of these changes is to use dynamic blocks. Dynamic blocks were introduced in AutoCAD 2006 and can be created and used in AutoCAD LT as we’ll. Creating blocks that have dynamic properties or adding dynamic properties to an existing block will enhance the block’s usability and can greatly reduce block counts. In the next few posts I am going to go over some basic features of Dynamic blocks that can make your regular blocks more flexible and save you editing time. For the first post I’ll just discuss the options I will be covering moving forward and in the next post I will dig in with examples. Dynamic blocks basically have two parts ‘Parameters’ and ‘Actions’. Parameters are the defining points or properties of your block and the Actions are what gets done with or to the block. The coverage will not be in this order; it will be based on a building of features. Obviously there are more Parameters and Actions available, but I believe that the ones discussed here are the most commonly used for a variety of situations. Plus, I need to leave a few for you to learn on your own! In the next post I’ll dive in to the easiest and most impactful – Visibility States . 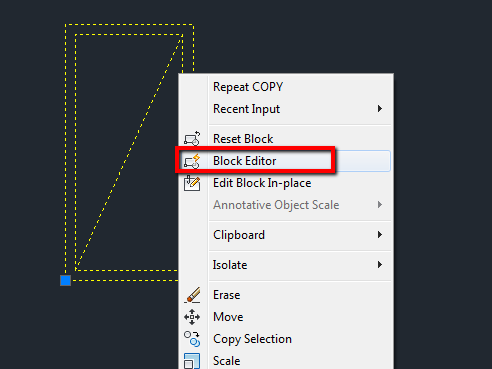 This is the 5th article in my AutoCAD 101 series – to read about the origination for this series, see the first post here: <Intro> The last post in this series was about how to use AutoCAD’s Block editor <link>, this post will be about some important “stuff” when creating or fixing existing blocks. There are some key things that you can do when creating blocks that will make your work easier and will make your blocks less likely to be exploded by other users later. Two items that I believe are foundationally the most important are Insertion Points and original creation layer. We will get into a lot more about layers in some future posts, but for now know that layer “0” (zero) will most commonly be the best block creation origination layer. Let’s start with the layer issue. When creating an object many think or believe that the block should be created on the layer it will be used on – this is not your best option. Let’s look at our 2x4_light block that we have been working with. If you’re an architect, you may like your lights on a lighting layer like ‘A-Lights’ or maybe you like to put everything on the ceiling on one layer like ‘A-CLG’ (please don’t do this, it’s a nightmare for anyone else using you ceiling plan). So when creating your block you create it on one of these named layers and set the color to Bylayer. The good aspect of this is that the layer, if it doesn’t exist will get automatically added when you insert this block. That’s pretty much the end of the good points. Now if the layer did not exist prior to inserting this block, you couldn’t insert it on that layer anyway as it did not exist until you inserted the block. You will have to move at least the first block after insertion. Let’s look ahead, a good practice to do when making blocks. If you at some point in the future are going to do an existing lighting layer, a new lighting layer and/or a demo lighting layer, how do you visually differentiate between them with the light fixture block? You can create these layers and assign them different colors and line types, but since your block was created on say ‘A-Lights’, your block will maintain the properties of the ‘A-Lights’ layer no matter where it is inserted. Although you could create this block as a dynamic block with various color and line type definitions you will lose the ability to isolate blocks by their layer location. There may be instances where specific details in the Block need to be hard coded to certain colors and line types, due to printing standards, but the first best choice is creating it on Layer ‘0’ and set color and line type to ‘Bylayer’. NOTE: For some additional flexibility, create the block on Layer ‘0’ and set the color and linetype to ‘BYBLOCK’. When the block is inserted, it will assume the color and linetype of the Layer inserted on, but the ‘BYBLOCK’ option allows it to be over-ridden. Use this option with caution however, as lazy drafters will insert the block on the wrong layer and then manually change the color and/or linetype to what it should have been had it been inserted on the correct layer. This will defeat your ability to isolate blocks by layer or select by properties. Imagine a demo layer being Cyan/Hidden and a light fixture block is inserted on the ‘A-LIGHT’ and manually over-ridden to Cyan and Hidden. You freeze the ‘A-LIGHT’ and it appears some demos lights go away – just one an example of what could happen. Another potential issue is future standards changes and client standards requirements. If you at some point decide to change your layer naming convention, all your blocks utilizing the old layers will have to be redefined. With blocks created on layer ‘0’ the standards change is a non-issue. If you’re not the team leader, and work as a sub consultant (electrical engineers, contractors, lighting designers) for a client and they require final drawings to maintain certain layer, color and line type standards, more issues will crop up with hard coded blocks. The 2x4_light block created on layer ‘0’ is usable by all parties. The next big item I often see that is a bad practice is the blocks defined origin or insertion point. Short of creating a block using the dynamic multipoint option (which in some situations is a great option) you need to choose an insertion point that makes sense. We will cover the multipoint insertion option during our dynamic block track. For our 2×4 light fixture, it will most likely be inserted in a 2×2 or 2×4 grid. With this in mind, creating the insertion point on one corner of the block is an excellent option. You don’t want to make the insertion point off the edge of the block or the middle point of a line, because it will rarely, if ever, match up to a straightforward insertion point on your grid. Bad insertion points will lead to blocks being ‘eye-balled’ on insert or inserted and moved, creating extra steps. With blocks, you can’t just use the lower left or midpoint of a block as a standard insertion point, because each block has unique insertion properties. For example tank type toilets, counter sinks and beds are a few items that may be centered on a wall or stall, but are typically shown from 1″ to 3″ off the wall that they are up against. Wall mounted toilets, sinks, and urinals may also be centered, but will actually be snapped on to the wall. Janitor’s sinks are usually tucked in to a corner of a janitor’s closet or mechanical space, so it would make sense that their insertion point be on the back corner of the janitors sink. The proper insertion points for blocks can vary greatly, but how the block is most commonly used is what should dictate the insertion point. See image below for block examples with their insertion points shown (blue square/grip). These two items are just a couple important items, to consider when creating blocks, but there are some other items to consider as well as some best practices to follow when making blocks for your master library. Purge the block drawing of any unused line types, styles, dimensions, etc. so that they do not get carried forward like an infection into future drawing files. (This is a common issue for drawing bloat, especially in 2013 and newer drawings without the DGN hot fix installed). When creating blocks with attributed text, make sure you check the worst case scenario for text length/size to avoid ‘Ugly’ blocks (see Figure 2). Also for attributed text blocks, choose an appropriate text justification (see Figure 2). Much of the above cleanup could be automated in a script which we will cover in a future customization post. Follow these steps when making your blocks and you will have cleaner drawings and happier users. BEDIT is useful in numerous ways, especially for long time novice block users or that never learned how to redefine a block. If you have been around long enough, you have seen doors and toilets that are rotated at the wrong angle or scaled way out of proportion throughout an entire drawing because someone screwed up the block definition. If you have been using AutoCAD for along time and have staid away from editing blocks because of old memories or just go straight to “exploding” (UGH!!! ), have no fear BEDIT pretty much makes those issues a thing of the past. 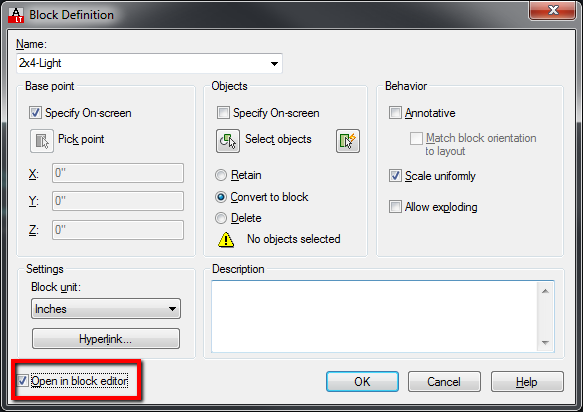 In the how to post, one item mentioned was that when creating a block using the BLOCK command you can check off the Open in Block Editor option when creating the block and it will open in new dedicated session for just the block being created – see Figure 1. If you are working in a drawing and you see a block that just does not look like what you need, but there are a bunch of them, the easiest thing to do is just edit it’s definition with BEDIT. Lets say that we want to change the 2×4-Light fixture block to include a solid, angled hatch instead of the single diagonal line through it. No problem, you can type BEDIT and select the block from the list (if you know the name) or just right-click on the block and select “Block Editor” from the pop-up menu – see figures 2 and 3. Once you choose BEDIT, your screen will change, and it will vary based on your current configuration, but you should see at least the following three items. To add the hatch, just start your hatch command however you normally do, pick a point to the right of the angled line and choose the solid hatch option. Select Close Block Editor from your Toolbar or Ribbon, select save changes, and see your new block. You can also rotate your block, change its colors, layers, linetypes, etc… so why Explode?!?! You get a background from a client that has furniture and the furniture is RED, which plots to heavy on your drawings. Even after changing the furniture layer to GREY, it still shows up as RED. Dang Architect… They defined the block with color by entity instead of Bylayer. No problem – open the block in your editor, select everything and set it all to color bylayer. Bam! – all done. The dynamic options are the most powerful, and we will be getting in to them in a couple weeks. I will skip this series next week as I will be attending Autodesk University in Vegas. When I get back we pick up by looking at some important options when defining blocks to get the best performance out of them. This is the 2nd article in my AutoCAD 101 series – to read about the origination for this series, see the first post here: Intro. The last post was about what blocks are and are not and why you should use them – <link>, this post will be about how easy it is to make blocks. In the previous post, I gave multiple examples of items that could be blocks, in this post I will make one of those blocks to show you just how easy it is. The following is a image of some basic blocks you would commonly use in your drawings. The lines are dotted because i have them all selected in order to show the insertion point. The color is controlled by the layer the block is on (we will discuss this in a future post) and the blue square shows the location of the insertion point of the block (we will get in to the importance of that in a future post as well). 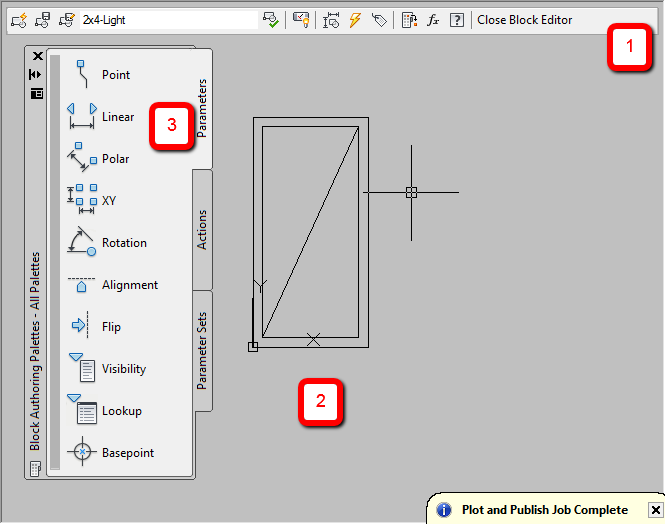 For this post, I will show how to make the basic 2×4 light fixture shown on the left. There basically three commands in AutoCAD to make blocks, “Block”, “Wblock” and “Paste as Block”. Since this is a basic level post, I will not cover every option, but rather the ones you really need. The BLOCK and WBLOCK commands are very similar, with the difference being where your block ends up. If you want to make a block that you only plan on utilizing in the current drawing, you would just use the BLOCK command. If you want to save the block out to your hard drive or server for use in other drawings/projects, you would use the WBLOCK command. Now, don’t worry if you’re not sure, because you can always save an existing block out of your drawing at anytime in the future using the WBLOCK command which will let you export an existing block just as if you had used WBLOCK from the beginning. The paste as block option is “ok” if you just need to make a down and dirty temp block that you will not likely use again. PLEASE – don’t make this your go to option, because if you want re-use your blocks, the “Paste as Block option will require you to do more work later to rename the blocks and fix insertion points. To show the differences between BLOCK and WBLOCK, I will show the most common options you should typically be using to create blocks. Draw the objects you want to make in to a block. For this fixture I will use the RECTANGLE, OFFSET, and LINE commands. You now have your light fixture symbol, you just need to make it a block. The Block dialogue will pop up. See Figure 3 for most important items. The red ones you will do for each block, while the Blue items should be your defaults. After hitting ok, select the lower left outside intersection of the light fixture. this will be your insertion point when you insert blocks. To use this block, just type insert, choose your insert button or ribbon and select the “2×4-Light” block to insert and choose an intersection for your grid to insert the light and rotate as needed. Draw the objects you want to make in to a block. Repeat drawing steps from above. The WBlock or ‘Write Block’ dialogue will pop up. See Figure 4 for most important items. The red ones you will do for each block. Note that the Wblock option requires a few in and outs where you need to select the Insertion point, (this can be required in the BLOCK dialogue also, if you do not have ‘Specify on-screen’ chosen), the objects, and the Destination (‘File name and path’). If you avoid any of the steps, it will prompt you to make your selections before finalizing the block. Annotative allows you to make Annotative or ‘autoscaling’ objects that will autoscale by the current ‘Annotation scale’ setting. This is great for symbolic objects that require scaling each time they are inserted. Items that are useful as Annotative objects include: Column bubbles, Key notes, graphic symbols of objects like electrical outlets, room names, north arrows, plan titles, etc.. This is a whole other topic I will touch on in a future post. Allow exploding is something that most savvy block creators will uncheck. How many times have you created a block only to find it exploded in a drawing? Ughh – Why? The user did not know how to adjust something in the block or as I have seen in some cases, clueless (non-educated) users think that exploding blocks will minimize drawing issues or is the only way to change a color or linetype. (See how to rectify this with the block editor in the next post). Block editor is a very handy tool that has taken away a lot of the issues that happened in the past from users not knowing how to redefine blocks. If you have been around long enough, you have seen doors and toilets that are rotated at the wrong angle or scaled way out of proportion throughout and entire drawing because someone screwed up the block definition. In the next post we will get in to this powerful and easy tool. WBLOCK has one key feature that BLOCK cannot do – Write your blocks out of the drawing. Typically you make your blocks using the BLOCK command and then Write Block them out to you companies Standards folder(s). Once you have created the 2×4-Light fixture using the BLOCK command, the following steps/graphic shows how you write it out to an external folder. Pretty easy huh? A way to quickly have the Write Block dialogue choose ‘Block:’ and choose the correct block to write out automatically is to highlight the actual block prior to typing Wblock. The steps above are based on command line typing, but you can access the BLOCK and WBLOCK commands through your ribbon and Toolbars as well – do whatever makes you feel more comfortable and start making your work go quicker with Blocks. 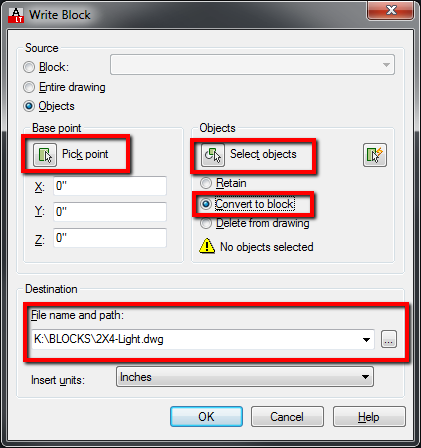 AutoCAD 101 Series – Blocks – What and Why? Blocks are easy!! Here is how…. 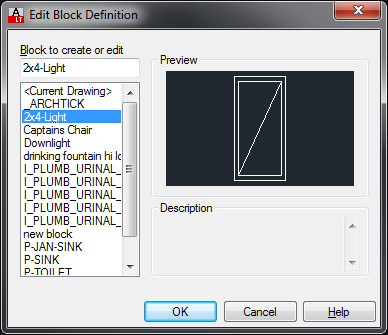 AutoCAD defines Blocks as: A collection of objects that are combined into a single named object. These objects can be symbols or details that are used to create representations of real world objects. Typically, each of these blocks is an individual drawing file, perhaps saved in a folder with similar drawing files. When you need to insert one into your current drawing file, you use the INSERT command (or enter ‘I’ in the command window). Basic line work that is drawn using standard drawing tools like line, rectangle, circle, etc. that are drawn and/or grouped together to represent one of the above items and copied around the drawing. The issue is that these are just linework – not “Named objects” and therefore not Blocks. They look pretty, but their also pretty useless. The above are all examples of linework that is drawn to look like something, then is inefficiently copied around to make a bunch of useless “copies”. BUT, Hey – they look pretty! Yes they do, but lets look at why this is a bad idea and why blocks are sooo much better. Let’s say you use a rectangle to represent a 2×4 light fixture and copy this around the drawing 60 times to represent your lighting plan. No lets say the plan is reviewed and someones requires that you change the look of the rectangle – like add an offset line, change its color, add a hatch, add some detail to it – whatever… To change the look, you would modify one of the rectangles and re-copy it to the other 59 locations – effectively starting over. If this Light fixture (rectangle) was a block, you would just redefine it and as soon as you save it, all 60 get updated! Yea! And to add to it, you can then use this symbol over and over again in other projects! What’s not to love? Some of you are going Duh!! Yea… well I see rectangles used as $#%&$ light fixtures waaayyy too often. This same concept can be applied to nearly any item you create with linework. Anytime you draw something that you intend to use again or “possibly” use again – make it a block. I do this even for ‘one-off’ items. I am sure you have drawn something on a job, then later, wish you had that same thing on another job. You typically go back and copy it and then paste it into the new job. Depending on how you do it, you will end up with copies of linework again or an anonymous block if you “paste as block”. Blocks reduce storage requirements – In AutoCAD, each line, arc, ellipse, text, etc. uses up memory, both for storage and RAM memory usage. If a chair is composed of 50 lines, arcs, etc and is copied around the drawing, multiple the number of lines by each copy – 6 times = 300 lines. A BLOCK having the same amount of lines will be counted once and then a pointer will be used to reference all the other locations. Objects (BLOCKS) are easier to move than linework – Try selecting all the copies of chairs or lights composed of basic linework vs selecting individual blocks. Even using the SELECTSIMILAR command, which depending on how you have it set will take possibly one selection vs many. With linework you typically would use a window or crossing to select your items, which means you have a high probability of selecting other items as well. Blocks can be grabbed with a single pick selection for each item or in multiples by using SELECTSIMILAR. You may be tempted to use the Copy and “paste as block” option (Ctrl-Shift-V) to make temp blocks. that look like: A$C19F91F38 This is not a BLOCK! OK – it is a BLOCK, but it is a temporary block made by copying and pasting objects as a block. This is a sad example of a block – Why? Now, if you are in to making dumb drawings and wasting time, then you are good to go, but if not, then you should know that Blocks are way easy to create! Taking shortcuts in life will sometimes come back to bite you. But there are some areas in life where shortcuts come in handy and make you more productive. 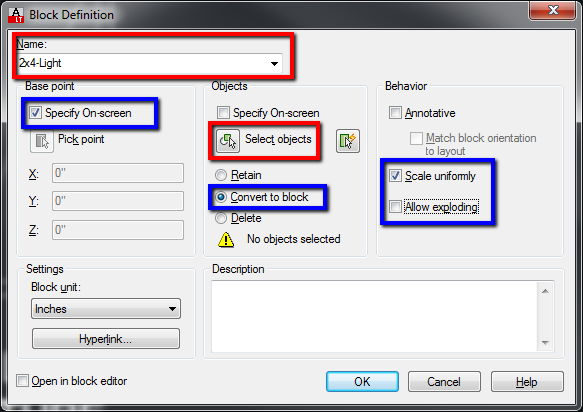 In AutoCAD there are shortcut keys that you can use to increase your speed and productivity. Many old-time CADD jockeys are very familiar with using shortcut keys either through CTRL keys and Function keys or through the ACAD.PGP file. If you are one of the newer generations CADD Jedis that were trained in AutoCAD to do 95% of your work with mouse points and clicks – A faster way there is! You may think you’re pretty productive that way, but adding in some shortcut keys can further improve your performance. Note that CTRL C, X, and V and F1 should be part of your everyday Windows toolkit. You can use this in all your office apps and most any program that allows copying, pasting and cutting – it is nearly universal. No more sliding up to the Edit menu and selecting copy, paste or cut. As with the CTRL keys above these are not the only shortcut keys available in AutoCAD but more of a sampling of the ones I think that will help increase your productivity. If you’re looking for a way to boost your performance try taking CTRL of AutoCAD. In a future post I’ll talk about ACAD.PGP file which takes shortcut keys to a whole other level. I would be curious to know how many people are already using these keys regularly – drop me an email if you are and which ones you find most useful. Email databases (Outlook PST files and Exchange message stores) are getting bigger and bigger as users send and receive large attachments every day. This has a domino affect in that it causes slow downs on servers, eats up network bandwidth, burns through backup media and extends backup and restore times. You can always enable compression on the servers, or buy more storage and get faster processes and more memory, but to what end? The nice thing about file sharing applications like YouSendit or Sharefile or even Dropbox is that for Email, it is just a text message with a link included – very small and very fast. The files are automatically uploaded to an offsite location and therefore are only on your network once so you do not have them backed up twice – unless your doing Dropbox which may also store an additional local copy that you may be backing up as well. There are a lot of variables in this which depend on the particular service you are using and which features, but the basic file sharing service uploads a copy offsite and then allows you to share it with a link. File sharing programs add other perks as well – they offer Email notices when files are accessed or shared and can offer password authentication for security. I have personally used both Sharefile and YouSendit and use Dropbox regularly for personal use and backups to make my critical data mobile. I like all three and for most businesses it would not be hard to justify their costs – they can even be free for small usage. These services add some efficiency to your daily workflow and on your network storage, email stores and backups, but is there a way to reduce some of the space requirements even more? Yes, and this is what this post is really about. For AutoCAD users, sharing data is a common occurrence. Architects share background files and other support drawings with their consultants and consultants in turn share their drawings back with the architects and other consultants. Most of thee file shares still happen through email and it is not uncommon to have project shared through a series of multiple emails because the files exceed either the sender’s or recipient’s email limits – especially those using “Free” email services for their email (That’s a whole other post entirely). There are a few steps that the person sending or sharing the drawings can do to minimize the drawing size and should be standard practice. Minimize copying other jobs in other current job to do your work. Use standard libraries and menu customization to insert your work or copy pieces as needed. I regularly deal with drawings with more than one project inserted in model space and in some cases I have seen up to five! Besides the file size, now everyone has to dig though the drawing to see which are the plans/elevations/sections that they need or call the architect/consultant for clarification. Purge! Yes, the big one. Since so many users still do use past projects for setting up new ones and copy items in from previous projects to address details in current ones, occasionally (regularly) purge your drawing – and definitely do so when sending them out. 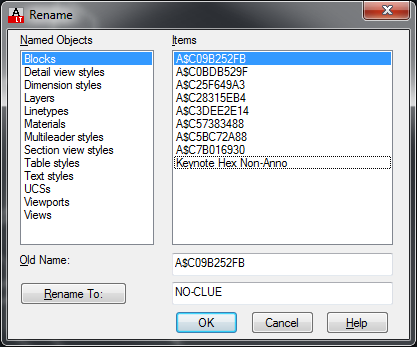 Deletes unused applications from blocks, detail view styles, dimension styles, groups, layers, linetypes, materials, multileader styles, plot styles, shapes, text styles, multiline styles, section view styles, table styles, visual styles, regapps, zero-length geometry, empty text objects, or all. Reduce your drawing size and potential for file corruption. This keeps your drawings lean and saves load and save times, server and backup space, network overhead and email storage and sending/receiving times. Purge can be done via the command line “-PURGE” or via a dialogue “PURGE”and it can be automated via a Macro or script. Note: This routine also does an AUDIT to check the drawing for errors. This routine was discussed in the “Macro Mania I” post and is included in the FS-Tools add-on menu that you can download here. What can purge do for you? On a recent project, there was an issue with the size of the drawings being shared so the sender made one attempt and received some failure notices by some of the recipients. They then started over and made them available on their FTP site. When I received the files, I typically clean them up for our use, and in this case I was curious to see just how bloated they were. I have a simple toolbar Macro that I use nearly every day for this that purges the drawing and runs an audit to make sure their are no errors, does a zoom extents and saves and closes the drawing. Running this Macro which is a single mouse click on the drawings knocked them down from 35meg to 18meg – nearly a 50% reduction – and that was without removing extra “stuff” from the drawings. I did this same step yesterday and reduced the files provided on an FTP site by 60%. This is a regular step in my cleanup and sharing process and takes seriously a couple seconds per drawing to perform. Doing this with a script using Scriptpro, you could do an entire project in a flash. I see these results on a regular basis, and sometimes the results are far greater. I am curious if others deal with this issue as well – answer these four quick questions on purging and file sharing.